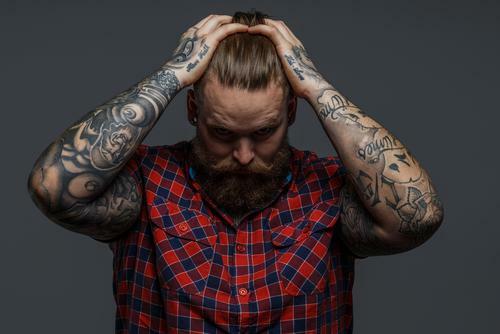 It is estimated that as many as 25% of American adults have one or more tattoos. When they got those tattoos, the intent was for them to be permanent. However, as is often the case, people’s situations can change over time and many people eventually don’t want that permanent tattoo anymore. The good news is that with modern pico second laser tattoo removal technology, most tattoos don’t need to be permanent anymore. Our bodies view tattoo ink as a foreign substance and constantly try to eliminate it. That is why tattoos seem to lighten slightly over time, but they never completely fade away. Our immune systems try to remove the particles of ink. However, most of those particles are too big for the immune system to handle. That’s why slight lightening is seen naturally over time, but overall, it is just a very small amount of change. Therefore, the tattoo is permanent. The correct type of laser energy that is selective absorbed by the tattoo ink, actually breaks up the particles of ink into much smaller particles. The body is able to better eliminate these smaller ink particles. The more times that the tattoo is treated, the more small particles that are created, and the more tattoo ink is removed. However, not all lasers are able to break up tattoo ink. And, not all lasers that can break up tattoo ink are able to do that equally. There are numerous variables that affect how effectively a tattoo can be removed. The first important laser variable is the wavelength of laser energy used. Different color ink will respond to different wavelengths of laser energy. For example, dark ink, such as black, should be treated with a different wavelength of energy than colored inks. Red ink is best treated with different wavelength energy than blue and green ink. Also, some colors are actually a mixture of different colors, so that is another important consideration. Another important laser variable is what is known as the pulse width. The pulse width refers to the duration of time that the laser pulse is emitted. The older generation of lasers that were used for tattoo removal, referred to as Q-switched lasers, used nanosecond (ns) pulse widths. The newer lasers can now use picosecond (ps) pulse widths. These pico lasers emit the laser energy 1000 times faster than the older lasers. Pico second laser tattoo removal is much more effective in removing most tattoo ink than the older lasers. At Shore Vascular & Vein Center, the latest state-of-the-art picosecond enlighten laser is used for tattoo removal. The enlighten laser uses multiple different wavelengths of laser energy to treat both and multiple colors of tattoo ink. It also combines the latest pico laser technology with the best qualities Q-switched lasers to provide unprecedented effectiveness in removing tattoos more completely, and in fewer treatments than with older lasers. If the smooth skin on your legs is marred by spindly, spidery veins, there are two pieces of good news — they’re usually not dangerous, and we can easily get rid them with our innovative laser technology. Summer is coming, and you want to show off smooth, vein-free legs in shorts, skirts, and a swimsuit. Have your unsightly spider and varicose veins treated now, before summer rolls around. Getting ready for beach weather doesn’t get easier as you get older. Fat stores can be more persistent, and no amount of exercise firms fat that’s above muscle tissue. The SculpSure® laser system offers a new approach to nonsurgical body sculpting. There are a lot of reasons to regret getting a tattoo, and the good news is you don’t have to live with it forever. If you’re one of the 23% of men and women with tattoo regret, Dr. Gosin can make your ink a distant memory. The discomfort and pain of varicose veins and spider veins last year round, but at least you can cover them up in winter with long pants and tights. And if you have them treated in winter -- you’ll be ready to flaunt smooth legs come summertime. Find out the answers to important questions that are common when it comes to laser tattoo removal.